I ran across this while I was working on upcoming Month in Review posts. If I have a block of time I will sometimes knock out a couple of those long in advance. Well, I’ll knock out the part I can do ahead of time, the looking back sections covering a year, five years, and ten years ago on the blog. That is the most important part of each month’s review post, at least to me. The review section is primarily about what I was posting back in the day. However, I have started adding in addition information for context of the time, usually in the form of launches or closures. Those will sometimes fall further back in time, being 15, 20, or more years ago. As I was tracking something down that came up in 2003 for a “15 years ago” entry I ended up on a website that has an archive of issues of Computer Gaming World in .pdf format. I started digging through the site, scanning various years. 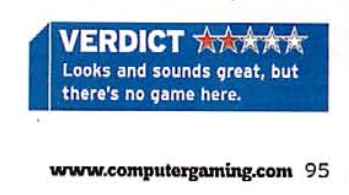 Computer Gaming World, which later became Games for Windows Magazine, stopped publishing back in 2008, having run for 27 year. During its run it covered a lot of computer gaming history. You can find the archive at http://www.cgwmuseum.org/ . Or you could find it there. At some point between Thursday night and Saturday the site went down. When I went back to continue looking I was greeted with error messages about the site having gone missing. The transitory nature of the internet is one of its major frustrations. Things change or disappear and data goes missing. Unless, of course, the Internet Archive is backing the site up. Fortunately I was able to find everything that went missing backed up and waiting for me and I was able to return to this gem from October 2003. Just for openers there is a preview of World of Warcraft from more than a year before its launch. There is also the CGW review of Star Wars Galaxies, something which will annoy the purists I am sure. And while those are worth the price of admission, there are just so many little things in the issue that are interesting to see. There are, of course, the ads. So many great ads. For SOE fans there are ads for the EverQuest Evolution, a roll-up pack of EverQuest expansions, the EverQuest Lost Dungeons of Norrath expansion featuring the all new “dungeon crawl” experience, and Lords of EverQuest, the Norrath based RTS. Anyway, if you have time to roll though video game nostalgia, you could find worse places to wallow. This entry was posted in entertainment, EverQuest, EverQuest II, World of Warcraft and tagged Computer Gaming World, Games for Windows, Lords of EverQuest, Star Wars Galaxies on September 23, 2018 by Wilhelm Arcturus. Compared to what? The RTS I guess? Also interesting how the art for that undead is far more ‘mature’ than the art in WoW today. 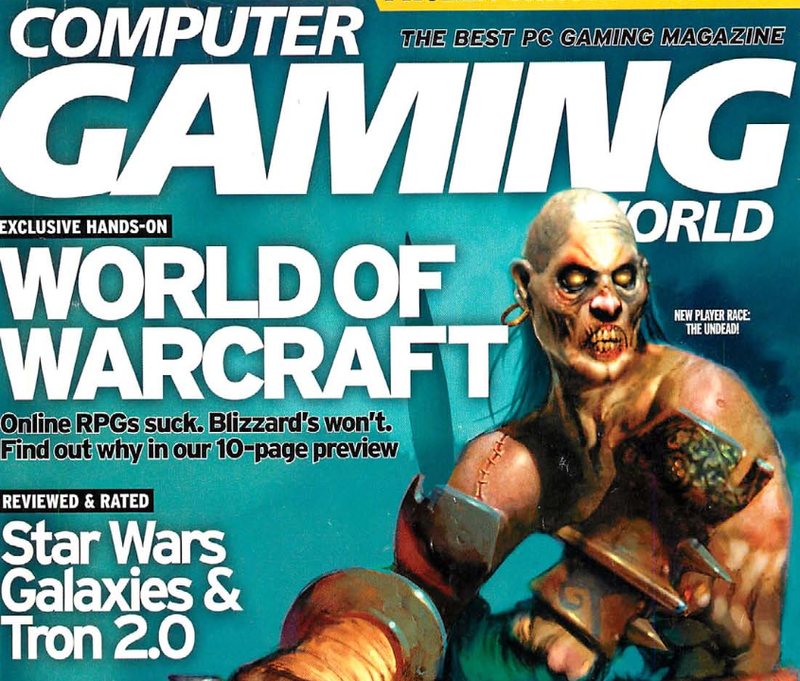 @SynCaine – In leafing through some of the issues for 2003, CGW seemed to be covering updates about WoW pretty regularly, so they might have just meant that it was something they hadn’t seen yet or something that just got added into the beta. It was interesting to go through that as 2002 and 2003 were pretty dead years for me as far as video games were concerned. We’d moved from our condo where I at least had ISDN connectivity to a house with no broadband options, so it was back to dial-up. And then we had a baby in the house, which was a big lifestyle change. So there is something of a gap between the Diablo II expansion and the launch of WoW where I wasn’t paying any attention to new video games. I’d gone back to the reboot of TorilMUD and only heard that WoW and EQII were things because people in our guild there were running off to play them. I completely missed the big build-up to the launch of WoW. I was into gaming during that time, and WoW was not a big deal at all, even in MMO circles, until the start of beta. Once our group got into beta, I remember all of us not being instantly blown away, but having more of that “I can’t stop playing it” feeling going. Pretty sure I was playing DAoC or AC at that time, and the switch to WoW in beta/launch was pretty easy (god I wish I was blogging back then). I remember the general feeling pre-beta was that we weren’t really interested in playing an EQ-clone, because we preferred the game style of DAoC or PvP AC. And then after beta we played on a PvP server and tried to make that the focus for a while, which I think a LOT of players did on those servers (lot of town raids, lot of group vs group fights in random zones). It’s sad looking back how all of that was slowly phased out by Blizzard, instead of supported and expanded.